This photograph was taken in July 2002 when she was allowed out of the prison for a few days by signing a personal bond, to meet with the Chief Minster of Manipur. She was re-arrested the following day. Around her are the Meira Paibis* (women "torch �Vbearers", who are in the forefront of the human rights movement in Manipur), in solidarity with her struggle. Irom Sharmila is a symbol of a lay person fatigued with the atrocities committed. She has neither political affiliations, nor a strong background of an activist. She was seen in public for the first time during the people's enquiry headed by Justice (Rtd.) Suresh. Then an incident took place. A place called Malom near the Imphal airport witnessed cold-blooded killings of innocent people by the Assam Rifles. They shot at point blank range eight people sitting at the bus stop in the usual garb of encounter with the insurgents. This sadistic action was taken 'lawfully' under the draconian law of Armed Forces Special Powers Act. The moment this news spread, Irom Sharmila, a very common girl of Manipur felt deep hurt inside her. She instantly declared fast unto death till this law is abolished. After some days she was taken to Hospital. There she refused to co-operate and was sent to Sajiwa Jail as she refused bail after being arrested on the charge of attempted suicide. Thereafter she is being commuted to and fro Jail to Hospital. Since last 4/5 months she was compelled to undergo nose feeding. Her condition is deteriorating everyday with her vital organs being slowly affected. Recently it was reported in newspapers that on hearing some rude remarks passed by some nurses she has refused even the nose feeding and has started sleeping on the floor along with the patients who are suffering from severe viral infections which are highly infectious so much so that other patients of the same ward have been evacuated. Nobody is allowed to meet her. What Irom Sharmila is demanding is neither an assertion of Meitei rights nor the Naga rights. She is demanding what the people in Manipur, as humans should have got long, long time ago. She is the only one at the moment who I think is a pure activist of "human rights". * The Meira Paibi is a unique woman's traditional institution of Manipur who are in the forefront of the human rights movement in Manipur. 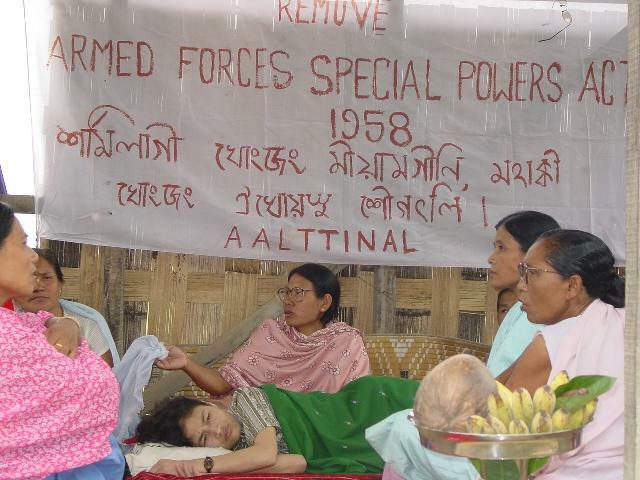 These are basically middle-aged women of the villages and town who keep vigil particularly at night to ensure that the armed forces do not pick up people form their villages or town. They hold bamboo torches and that is how their name the "Torch-Bearers" (Meira Paibis) came about. When Sharmila started her fast many of these Meira Paibi goups from all over Manipur came together under the banner "Amuba Aain Louthoknaba Taksinbada Tengbangba Imasingi / Nupisingi Apunba Lup" meaning, "Mother's Solidarity Group to Remove the Black Laws". This institution has deep roots in the Manipur culture.